What is your favorite summer dessert? For myself (Leah), I would have to say ice cream. I usually eat my ice cream either plain or loaded up with as many toppings as possible. However, I occasionally get a craving for a fruit-based dessert like a cobbler or a pie- I’m not a huge fan of crisps. One fruity dessert that we hadn’t tried before now was a galette, which is a free-formed pie. It also has a higher crust/fruit ratio than a traditional pie. Some beautiful nectarines sitting on the counter finally gave us the push we needed to try making one. The galette was, of course, delicious. 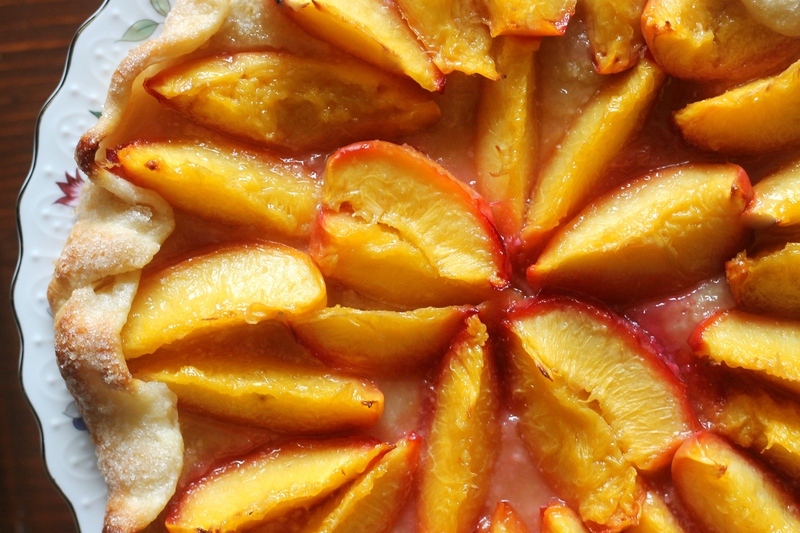 How can you go wrong with a homemade crust and perfectly ripe fruit? This galette gets an extra-special touch from a layer of ground almonds (we used almond meal) and sugar between the fruit and the crust. It helps the galette from getting too messy and it adds a hint of almond flavor. I think it’s safe to say that we will be making up for lost time by baking many more galettes this summer. 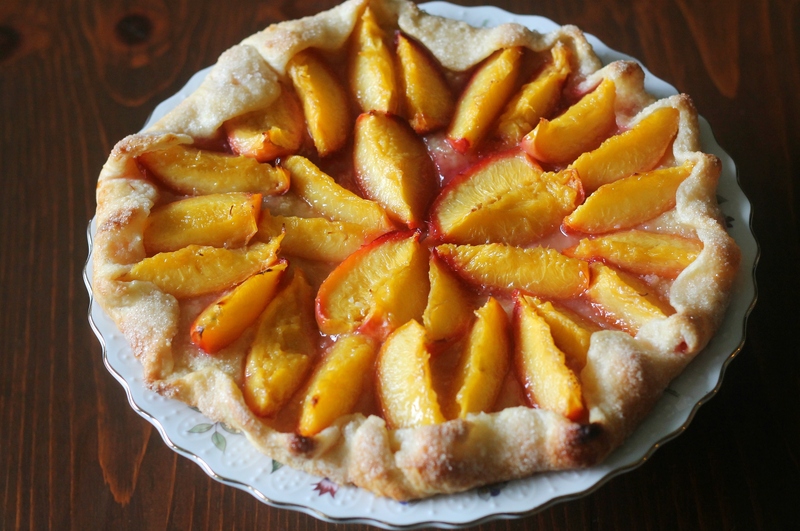 This particular recipe would work really well with peaches. We’ve been eyeing a cherry galette for a while, and apple sounds great as well. The question is, which one to make next? Combine the flour, sugar, and salt in a large mixing bowl. Using your fingers, two knives, or a pastry blender, mix the butter into the dough until it is the texture of coarse cornmeal. It should still have a few small lumps in it. Add four tablespoons ice water to the mixture, using a rubber spatula to combine everything. Form the dough into a mound and knead it together gently for a few seconds.If it is still crumbly, add a little more ice water a tablespoon at a time. Form the dough into a flat disk and wrap tightly with plastic wrap. Refrigerate for 30 minutes or freeze for 15. To roll out, put the disk of dough on a square sheet of parchment paper. Dust both the dough and a rolling pin lightly with flour and roll into a 14-inch, 1/8-inch thick circle. Transfer to a baking sheet and refrigerate for 30 minutes or freeze for 15. Preheat the oven to 400 degrees with a pizza stone or an overturned baking sheet in the middle of the oven. Meanwhile, mix together the almond meal, flour, and 1 tablespoon plus 1 teaspoon of sugar. Wash your nectarines and slice (unpeeled) into 8 wedges. A hint for getting the two halves of the nectarine apart: slice on top of the small “seam” that runs down the side of the fruit. The pieces will come apart easily. Just remove the pit and slice! Combine your sliced nectarines and 1/4 cup of the sugar. Remove the dough from the freezer and top with the almond mixture, leaving about a 2-inch border. Arrange your nectarine slices in tight concentric circles, making sure to leave the 2-inch border bare. Fold the border up over the edge of the fruit, crimping as you need to and making sure there are no holes in the dough. Brush the border with melted butter and sprinkle with 2 tablespoons of sugar. Transfer the galette to a pizza stone and bake for about 40-50 minutes (start checking at around 35) or until the crust is lightly brown and the fruit is starting to caramelize. Slide it onto a cooling rack and let it cool for at least 15 minutes. Serve warm or at room temperature. Enjoy!